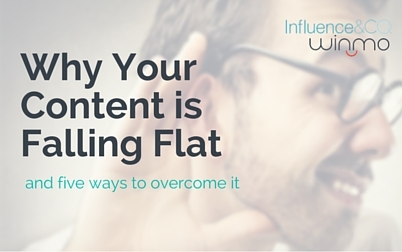 Why Your Content Is Falling Flat and Five Ways to Overcome It from Winmo on Vimeo. Co-Presented by: Brittni Kinney | Client Engagement Specialist of Influence & Co.
As a marketer, you’re spending increasingly more time creating what you believe to be relevant, compelling content that you hope your prospects and clients find and engage with. Content that teaches them something new, and content that entices them toward taking action with the product or service that you’re ultimately marketing. But, after all the time you spend researching, writing and distributing your content, are you really getting the “mileage” and results you expect? In many cases, I hear from my peers that it feels like their content is falling fat with no return. Decreasing engagement rates are making them question the validity of the content marketing strategy and they need help, right now. We’re missing the tech tools necessary for putting our content in front of key decision makers. The distribution channels we’re using have minimal engagement and aren’t bring in qualified prospects. We’re struggling to create engaging content that our audience wants to read, while also accomplishing our team’s goals. Increase engagement and strengthen your content marketing’s ROI by leveraging the insights found in this video today.